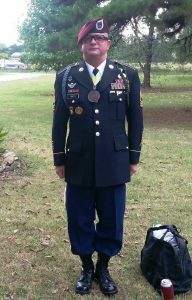 Adam, 45, is a retired Airborne Ranger who lives in Inola, OK, about 20 minutes east of Tulsa. Adam graduated from the Professional Welder program at Tulsa Welding School in January 2018. Thanks for sharing your story, Adam. How long have you been welding? I was pretty much 100% a novice when I started the program. I’d done some very minor things, but nothing to brag about. I started welding school in July 2017, so it’s not even been 18 months, really. What made you come to welding school in your mid-40s? I served 23 years in the U.S. Army. After I retired, I did a bunch of stuff here and there. I made really good money, but I wasn’t happy. I figured I’d stop working and just potter around the house for a while, but I got bored. I went to a job fair with my wife, who is also retired Army, because she was looking into a job. I got talking to Margo McCann [assistant director of admissions at TWS] at the fair. I told her I was bored and she asked, “how about welding?” I used my GI Bill, and here I am. My wife ended up going back to school to get her Master’s degree at OU, and I went to welding school. Thank you for your service, Adam. What was your job in the Army? I was an Airborne Ranger and a sniper. I’ve been in a couple of fights. I’m from all over. My father was in the military. I was born in Iowa and raised in Oklahoma and Germany. After I retired from the Army, I moved back to Oklahoma from Hawaii. I came here to take care of my family that moved here, and I just love Oklahoma. I’m an OU fan, and it’s kind of hard to go to OU football games when you’re in Hawaii. What did you enjoy most at Tulsa Welding School? I was a student ambassador. I really enjoyed mentoring and being a leader to some of the younger kids. Sometimes I’d just give them life advice, maybe teach them about investing or something. I’d try to help them get set up for their life. Being a mentor to those kids, who are now young men and women making a decent living, was my favorite part. What was your first job out of welding school? I took the advice of the instructors to build my résumé. They said that if you build your experience and your reputation, then people will start calling you. So I went to work in a shop doing a lot of MIG and flux core, while also trying to keep up my skills on TIG and Stick. That advice clearly paid off because I understand you start a new job next week? Yes, I do. I’m leaving for St. Croix in the US Virgin Islands on Monday. I’ll be there for 18 months. One day I got a call, took a weld test and got offered this job with ParFab Companies. They offered me $40 an hour, plus a per diem. ParFab is a contractor. I’ll be working at a refinery they are restarting. That sounds like a great opportunity. It’s about $3600 a week. I’m going to invest most of it. Both my wife and I are retired from the Army. We could retire now and live comfortably with a sizeable amount of money we have. I’m using this opportunity to invest and set my family up for the future, as well as give my wife a more comfortable life. I have a son who turns 16 in January. His passion is computers. He wants to be a computer engineer. I’m going to 100% support that goal and see if I can do my best to get him into MIT. Will the family move down to the Virgin Islands with you? No. I’ll be working three weeks on, one week off, and will be living in a man camp. So when I’m off, I’ll rent a house down there for them to come visit, or I’ll go home. My wife and son are already excited about Christmas in St Croix! Sounds tough! What’s your career goal beyond the next 18 months? I’ll do this for a while, then go back to Tulsa Welding School and take their Certified Welding Inspector course [Associate of Occupational Studies in Welding Technology]. I’m an old man, so I’ve got to protect these bones. Being a certified welding inspector is not as hard on the body! I enjoy welding because it’s just me under a hood. Give me a job, leave me alone and I’ll get it done. But it’s also an art, and I’m not an artistic guy! I’ve welded all kinds of things. I’ve made a lamp out of a cam shaft and a Harley Davidson gas tank. I enjoy doing stuff like that. I like being able to do stuff that other people can’t do or won’t do because it’s too tough. I’ve always been that way. Did you make some connections at Tulsa Welding School? I’ve been keeping track of the young men in my class, following what they’re doing, giving them advice and encouragement. The good thing about this group is that I’ve seen them saying to each other, “Hey, you need a job? I can get you a job here.” It’s a networking thing, and a lot of being a welder is networking. What advice would you give to new students starting out at Tulsa Welding School? Treat the school as a job. Tulsa Welding School puts out a lot of people every year, but unfortunately, not every person gives it their all. Some are just there to collect a paycheck, or in this case, a piece of paper that says “diploma”. They are not there to learn. Having a piece of paper that says you completed welding school won’t get you great-paying jobs. Your skills and attitude will get you those opportunities. Tulsa Welding School is like life: you’re going to get exactly out of this what you put into it. We didn’t dilly dally, we showed up on time and studied hard. We put the time in. The reason I’m making the money I am, and the kids in my class got the jobs they got, is because we all went there to work. One of the young men I went through school with, he’s just 20 or 21 years old, and he’s now making $4500 a week pipelining. We did not accept a passing grade. We wanted 90s, 91s, 94s, 97s. I never saw a 100, but as I always said to them, in the pursuit of perfection you’re going to achieve excellence. Keep going for that perfect score. If you’re not perfect, keep working for it. That’s why these kids are getting the opportunities they are because they gave it their all, trying to get that 100. Never be afraid to take a chance. Sometimes the biggest risks offer the biggest rewards.